Thirty-three years after its visceral introduction, the titular villain in Ridley Scott’s 1979 science fiction classic Alien has yet to be matched within the genre, or anywhere else, for that matter. Easily one of the most nightmarish creature designs of all time, the “adult alien,” as it’s been referred to over the last three decades, is a brilliant construction of emotionless, inhuman evil: acid for blood, a long reptilian head without eyes, and a tongue that has its own second mouth attached. Designed by Swiss artist H.R. Giger, and inspired by his "Necronom IV" painting, it’s precisely the kind of beast you wouldn’t want to come across on a darkly lit, vacant spaceship, as the crew members of the Nostromo learn the hard way. Five Alien-related movies later, Giger’s hideous creation has been given a family tree full of equally unattractive, though just as scary, extra-terrestrials, all with a shared penchant for murdering us poor humans. How they play into the Alien prequel Prometheus (in theaters today), director Scott’s return to the franchise, is part of the film’s mysterious appeal, and something we’re not about to spoil here. 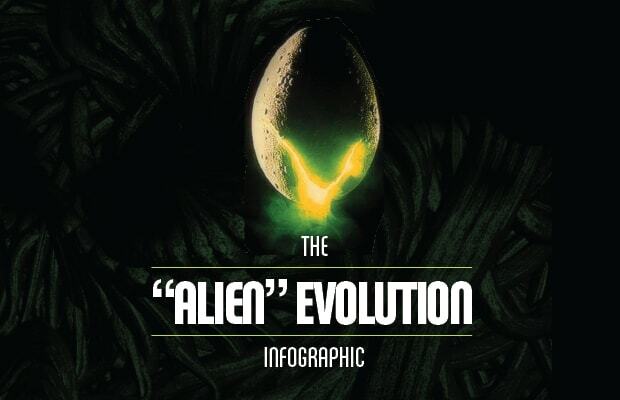 What we will do, however, is get you ready for this summer’s most anticipated sci-fi blockbuster by mapping out the Martian progression that has led up to Prometheus, in a little something we like to call The Alien Evolution Infographic.